Now that the exit from Afghanistan is in sight, how have Canadians upheld the other end of our military activity in maintaining peace in the troubled regions of the world? In two words: we haven't. In Ottawa these days we increasingly hear of the "peace dividend" -- the resources that will be freed up once our commitment to Afghanistan is terminated early next year. But it's something of a misnomer, since we'll be departing a country and region seemingly in a state of constant conflict. Perhaps it would be better to term it the "exit dividend." Either way, we're about to see some extensive changes in our military resources and financial commitments. For a decade we have been a nation at war -- a long time compared to the First World War (four years) and the Second World War (six years). And for at least half of that time, Canada's participation in the mission hasn't sat well with a large number of Canadians. It has been a war hard to comprehend, difficult to protract, and seemingly impossible to win. Canadians continue to pay tribute to the significant contributions of our men and women in uniform; that has never been in question. But a war in a far off land that is often beyond our capacity to grasp has now altered the national mood to the point where many citizens just want out. 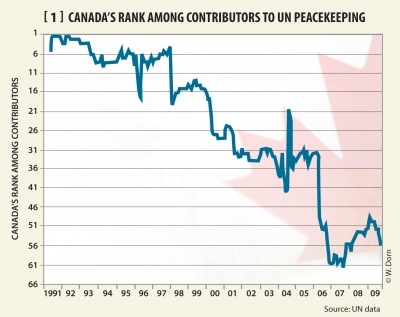 Canadians seemingly prefer our historic role as peacekeepers. Rightly or wrongly, Canadians don the peacekeeping mantle like a comfortable old leather jacket. For most of us, this form of military activity was all we heard of growing up and we cradled ourselves comfortably in the knowledge that we persisted in the Pearsonian legacy of peaceful security. So how has that been going for us? Now that the exit from Afghanistan is in sight, how have we upheld the other end of our military activity in maintaining peace in the troubled regions of the world? In two words: we haven't. In fact, while our gaze has been fixated on the Afghan conflict and our limited military action in Libya, our peacekeeping commitments have careened off the rails. At present, the United Nations has deployed more peacekeepers than at any other time in its history. UN peacekeeping personnel have grown more than five-fold in the last decade -- a hefty increase. Other than the United States, the 97,569 personnel deployed by the UN in peacekeeping operations are the largest in the world - more than the UK, France, China and Russia combined. With the demand and deployment of peacekeepers higher than at any other time in history, it's sad to learn that Canada's commitment to what Canadians themselves believe to be a pivotal part of our identity has in fact sunk to all-time lows. Though it's hard to pin down an exact number, it appears that the number of Canadian military personnel committed to peacekeeping is at around 60. That's for military personnel. When you add to that number the policing forces Canada dispatches, the result is only marginally better. For those hearing this for the first time, your shock is understandable. Did Afghanistan absorb so much of our military resources that we have now sunk to the point where we are ranked 56th out of the 66 nations contributing to peacekeeping? It now appears so. While our financial commitments to UN peacekeeping operations have increased with demand, our actual commitment of peacekeeping personnel has plummeted. We have fallen from being the world's largest contributor of personnel prior to 1992, to near the bottom. I suspect it's true that neither Canadians, nor successive federal governments, set out to plan it this way, but now that we're here, what do we make of it? Clearly Afghanistan has taken up the lion's share of our military capacity. But did it have to be accomplished to the detriment of peacekeeping to such low levels? 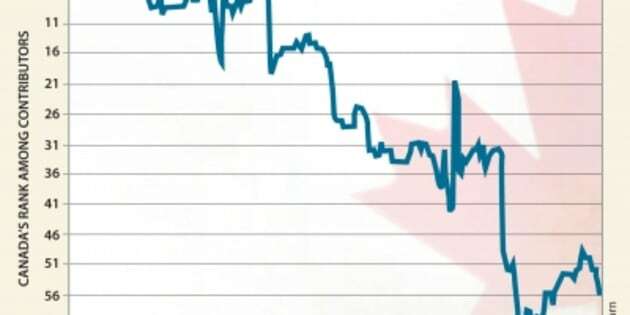 Something went wrong along the way, and it's likely that Canadians aren't comfortable with the direction. At a time of pride in our Afghan forces, it is ironic that we should feel a sense of national and international embarrassment over how we've squandered our peacekeeping legacy. The Harper government has put forward no plans on how to rectify the problem, and Parliament has been too fixated on retail politics to take the challenge seriously. Perhaps it's time we started.